M0PLA/P SOTA Activations: 22nd April 2017. GW/NW-033 & GW/NW-036 SOTA Activation visit. 22nd April 2017. GW/NW-033 & GW/NW-036 SOTA Activation visit. GW/NW-033 & GW/NW-036. 22nd April 2017. Grid SH 711059. & Grid SH 683041. Altitude 667M & 634M. This weekend's activation covered two summits, GW/NW-033 Tarren y Gesail being the first summit followed by GW/NW-036 Tarrenhendre. I was away camping this weekend with a few members of (TDARS) Telford and District Amateur Radio Society. It was International Marconi Day 2017 and as usual the club puts on a special event station at the Marconi Bungalows in Tywyn. 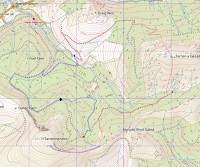 The site happened to have two SOTA summits close by and I thought it would be rude of me to ignore them. I left camp at 7:00 a.m. and headed towards my car parking location of grid SH 68967 05884 I had arrived and sorted out all of my gear by 07:30 a.m. and had started my ascent up towards my first summit. I arrived eventually at 08:50 a.m. the route taken was not too bad, the final ascent after you leave the forest is very steep and not a nice climb. The route is marked red on the map below, parking is marked by the blue circle. The summit can be seen in the first photo taken from the car parking area. I had planned to activate 2M only on my first summit which I did and had 5 QSO's my first was GW4VPX (Allan). I finished my last QSO at 09:30 a.m. and started towards Tarrenhendre. The first photo shows Tarrenhendre in the distance just a little over two miles as the crow fly's. The first part of the descent was due south and was a little tricky due to the large tufts of grass. The second photo show's the view back up Tarren y Gesail from the start of the road at close to Grid SH 709050. The third photo is just as you depart the forest and road at grid SH 695042 as seen the forest has been felled at this point. The final ascent towards the summit is long and up hill all the way with no let off until the final 100 meters. I finally arrived at the summit at 11:28 a.m. and set up my 2M and 20M Dipole's and started calling CQ on 2M at 11:49 a.m. and 4 QSO's in 11 minutes. I then tried my luck on 20M and only managed one QSO with SM5CZQ (Ken) in Sweden. After another 20 minutes of trying I went back on 2M and had a S2S with GW4TJC/P (Simon) on GW/NW-035 and G6DFD (Mike). My activation completed I started my descent at 13:06 p.m. I followed the blue route on the map above. This is where my problems started, please heed these warnings DO NOT TRY to take a short cut down the fire breaks, as seen on the map from the RED circle this is roughly were I decided to try to make my route as close towards the disused quarry as I could by following the marked fire breaks on my map. The route gets harder and harder, you can't get close to the quarry as there is a barbed wire fence all around the site. Then I looked at the map and didn't want to walk all the way back to the red circle so I headed east to pick up the track at the black circle. This route got harder and harder with brambles and lots of close knit conifer trees, I should have turned around but pig headed I decided to continue. It got so bad that I was using my old army training and was at one stage seal crawling my way through with my pack on my back. (I left the army 25 years ago but it seemed like yesterday during this event). I eventually made it to the black circle located on the map but as I was just about to leave the tree line I slipped and twisted my ankle. So the last 2.2 miles was a very painful journey. I eventually made it back to my car at around 16:20 p.m. with a very good lesson learnt, DON'T USE THE FIRE BREAKS. Ouch! Rotten luck. Activator love their ankles. It used to happen to me a lot. Pacerpoles and concentration works for me. I think TDARS were kind enough to host me at Tywyn on at least 3 occasions. I was able to activate the 5 summits that flank the Dysynni valley. 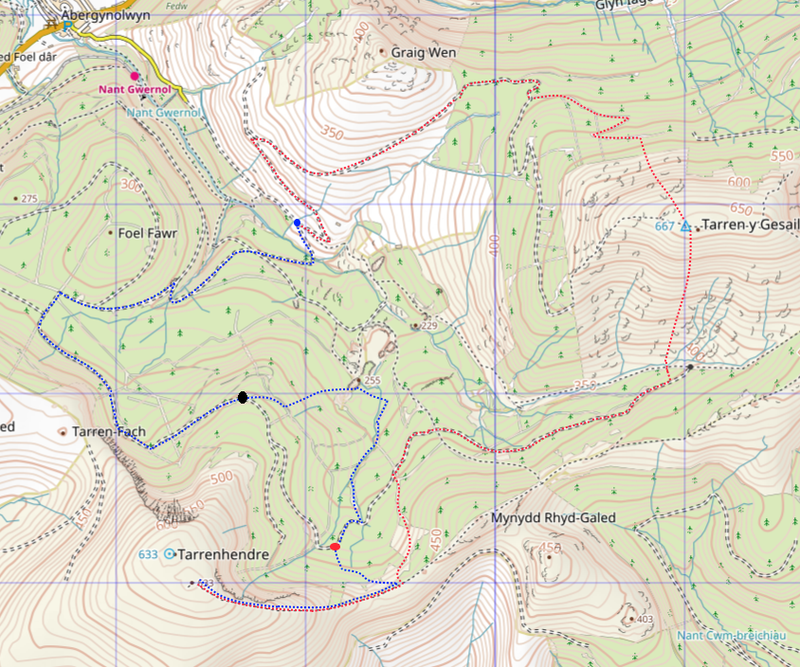 I made 2 separate walks of the Tarrens. Hi David thanks for the comments. Hope you are well? It has been a few weeks since I managed to talk to you on a summit. It was a large learning curve this journey. 15th April 2017. GW/NW-002 SOTA Activation visit. 8th April 2017. GW/NW-034 SOTA Activation visit. 2nd April 2017. GW/MW-002 SOTA Activation visit.